Geoff Marcy has had a hand in discovering more alien planets than anyone else. Since astronomers discovered the first planet beyond our own solar system back in 1992, they've been on somewhat of a roll — the tally now tops 500. And the finds are about to ramp up dramatically. Today (Feb. 1), NASA's planet-hunting Kepler mission will make much of its data public. A press conference will follow tomorrow, during which researchers are expected to announce intriguing new information about many more possible alien planets. Humanity thus appears poised to enter a productive new era in the study of alien worlds. 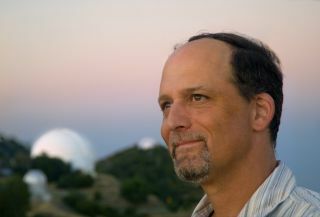 One man leading the charge is Geoff Marcy, an astronomer at the University of California, Berkeley, and a Kepler co-investigator. Marcy has had a hand in finding more alien planets than anyone else. He helped spot 70 of the first 100. He also found the first multi-planet system around a sun-like star, and he discovered the first planet that transits — or passes in front of — its star from our perspective on Earth. SPACE.com caught up with Marcy last month in Seattle, at the winter meeting of the American Astronomical Society, to chat about the accelerating pace of planet discovery, what we still don't know about alien worlds and whether there might be intelligent life elsewhere in the universe. SPACE.com: What has led to the recent explosion in alien planet discoveries? Is it primarily better instrumentation, or better techniques? Marcy: Well, let me give you a different vantage point. There is a bunch of astronomers who've been working really hard, and they're really innovative, pushing on the frontier technically, pushing on the frontier in terms of the science. And basically burning the midnight oil, essentially literally. I'm giving you the human component of all of this, because sometimes you don't get to see it. What sometimes gets lost in the shuffle when a nice result shows up on all of the Web pages and the newspapers around the world — what you don't realize is to get that result meant that five or 10 people were burning that midnight oil, trimming the errors down to the point that the Earth-size planets are detectable. It's easy to dismiss the discoveries as, "Oh, it's new computers, or it's new optics." These things happen because amazing people dream and then put their dreams into perspiration-dripping action. SPACE.com: So if we were to have this conversation in 20 years, where do you think the total exoplanet count would stand? Marcy: Honestly, Kepler's so good that it's hard to beat it. It gets the numbers. Kepler's going to find thousands. There's going to be another follow-up to Kepler, either from Europe or the U.S. or both. They'll find thousands. SPACE.com: Will this discovery arc we're on now continue to go up exponentially, or will it plateau? Marcy:It'll plateau, because you can't do much better than Kepler. But let's be fair here. It's not the number of planets we care about; it's the quality. We want the Earth-size. We want planets in the habitable zone, and ultimately planets that are sending little radio signals to us for some reason or another. SPACE.com: You've said that, with exoplanets, theory has really struck out. What are some of the things that we thought we knew, but it turns out were totally wrong about? Marcy: Well, the first thing — I go back to 1996. No one wants to talk about this, because it's so embarrassing. The reason that as a community we struggled to find the first hot Jupiters isn't because we didn't have the technology. It's because the theorists led us astray. I'm speaking slightly jokingly, but not really. There were theorists who said, "Look at our solar system. Of course the small, rocky planets are close in. The host star burned off the gases, so you're left with rocky planets. And look at the giant planets like Jupiter and Saturn — they had to form farther out, because it's colder, and the gases can gravitationally stick to the planets. Therefore, all planetary systems will have the following architecture: There will be an inner planet. The second planet out will be named Venus. The third planet out will have great lattes." I mean, it was just silly. SPACE.com: And that's based on a sample size of one. Marcy: It would be like trying to characterize human psychology by going to one distant Indonesian island and interviewing one person, and thinking that that gave you the full range of human psychology. And in 1996, there were papers where they said, Jupiter-sized planets, Saturn-sized planets, will all orbit far from their host star. Well, that of course tells you what to look for. If you write a proposal to try to find anything else, you're flying in the face of wisdom. And we know now, of course, how near-sighted that was, how parochial that was. SPACE.com: So do you think we are starting to get a handle on exoplanets now? Marcy: I think so. We're always a little too confident, so I would hate to say, "Go home, we're all done." We do have these planets we're finding with Doppler work, and now with Kepler, that are five times the size of Earth, three times the size of Earth, 1.4 times the size of the Earth. And I don't think we really know how they formed. Even the one we announced [the rocky, nearly Earth-size Kepler-10b], there are two main ways it might've formed. It might've formed like the Earth, or it might have formed like Uranus but it got so close to the host star that the gases and the water got evaporated away and left a bare, rocky core remnant. SPACE.com: What are some of the biggest mysteries that are left? Marcy: There's one huge one that nobody really wants to talk about. It's the age-old question: Are Earth-like planets common? We know they're out there for sure. I mean, there's too many stars. But there's two parts to the question. What do you mean by "Earth-like?" And then, how common are they? Basically, we know what we want for Earth-like, so we shouldn't beat around the bush: We would love to know whether there are planets suitable for life as we know it. And those Earth-like properties are a little bit mysterious, but we have some ideas. You want water in liquid form, you want stable temperatures over the course of millions, preferably billions, of years so that Darwinian evolution can get a good toehold. You probably want a moon to stabilize the spin axis. You probably want a Jupiter to sweep up the debris. You probably want a stable ocean for a long enough time that it can serve as the solvent for biochemistry. So that's probably what we mean by "Earth-like." But how common they are, we just don't know. SPACE.com: Your research suggests that smaller planets may be pretty common — that nearly one in four nearby sun-like stars could host a roughly Earth-size planet. Marcy: Yeah. But here's the sleeper idea that no one wants to talk about: Because Earth-size planets are so much smaller than the Jupiters, Saturns, Uranuses and Neptunes, and we now know that planets often get thrust into eccentric and misaligned orbits, the Earths are like the Volkswagens on a highway full of 18-wheelers. The vulnerable planets are the small ones. And so to the extent that planetary systems undergo a billiards era — the Earth would be like putting a small marble on a pool table of 15 billiard balls. As you break, the little planets are going to be the ones slingshot right out of the solar system pool table. SPACE.com: It's one thing to say they can form. But to say that they'll actually stick around long enough — that's a totally different question. Marcy: Yeah. And I think they'll form. It's hard to imagine they wouldn't. If you make Jupiters, why wouldn't you make Earth-size planets? But the Earths — and maybe the Volkswagen is giving it too much credit. It's an 18-wheeler and a tricycle. Earth is a tricycle on Highway 5 running up and down the Pacific Coast. And you don't even have to hit the tricycle. You just have to come close enough that gravity slingshots the poor tricycle right out of the system. So it's possible that Earth-like planets form, they get thrown out into the cold darkness of the galaxy and they have no chance of starting — never mind sustaining — life, because it's too cold out there. And that's possible. We might be rare. And by the way: Where are the SETI [search for extraterrestrial intelligence] signals? There is a non-detection that's like the elephant in the room. Forty years of Frank Drake and Carl Sagan looking for SETI signals, and we have precisely zero to show for it. So there's an indication — not definitive — that maybe the Earth is more precious than we had thought. SPACE.com: Our solar system is so young, compared to the universe. And the universe is so big. So there's been lots of time and opportunity for advanced civilizations to get started, and to try to contact us. Some people think that the fact that we seemingly haven't been contacted means that we may well be alone in the universe. Marcy: Well, you have to fold it in. The absence of an intelligent radio or television wave from any advanced civilization represents one indication, not a proof, that maybe habitable planets that sustain Darwinian evolution for a billion years —maybe they're rare. Maybe. SPACE.com: What do you reckon? Do you have a gut feeling about this? Marcy: I do. If I had to bet — and this is now beyond science — I would say that intelligent, technological critters are rare in the Milky Way galaxy. The evidence mounts. We Homo sapiens didn't arise until some quirk of environment on the East African savannah — so quirky that the hominid paleontologists still can't tell us why the australopithecines somehow evolved big brains and had dexterity that could play piano concertos, and things that make no real honest sense in terms of Darwinian evolution. Why the high chaparral on the East African savannah would've led to a Tchaikovsky piano concerto, never mind the ability to build rocket ships — there's no evolutionary driver that the australopithecines suffered from that leads to rocket ships. And so that — and the fact that we had to wait four billion years without humans. Four billion years? SPACE.com: Yes, it took four billion years to get there. Marcy: Since the Cambrian explosion, we had hundreds of millions of years of multi-cellular, advanced life in which, guess what happened with brain size? Nothing. You know the greatest species ever to roam the Earth? The dinosaurs — every kid knows this. And why? Well, because for 100 million years, the dinosaurs roamed the Earth. There were big ones, there were small ones. Every generation of baby dinosaurs had to outcompete all of the other dinosaurs. And you would think after 100 million years, each generation of baby dinosaur that was a little smarter would have out-survived the others and thereby slowly but surely increased dinosaur cranial size. The reality from the paleontological record? Dinosaurs had the brains of chickens, and never got bigger. It shows that braininess is not a primary driver in evolution. We humans came across braininess because of something weird that happened on the East African savannah. And we can't imagine whether that's a common or rare thing. SPACE.com: People assume evolution is directed, and it's always leading toward higher complexity and greater intelligence, but it's not. Marcy: It's not. Dinosaurs show this in spades. SPACE.com: You've said that we're about to enter a golden age of direct exoplanet imaging. Is that what the future holds — getting good, direct looks at alien planets to try to gauge their potential to support life? Marcy: It is. There's two great things that we should be doing. One is that we should, as a species — and this means ESA [the European Space Agency], Japan, China, India, the United States, Canada — work together internationally to fund a space-borne telescope, probably interferometric, that can take pictures of Earth-size and Earth-like planets. We know how to do it. Yes, it'll be expensive, but we do expensive things in science, and this is a great quest for humanity: Are there Earth-like and, indeed, habitable planets out there? But the other thing to do — we should say it right away. We should have a full-fledged, Apollo-like SETI search. Why haven't we coherently gathered our resources and done SETI right? SPACE.com: Finding alien intelligent life would be such a huge deal. It would change the way we think about ourselves and our place in the universe. Marcy: Exactly. So why aren't we putting together our resources, nationally and internationally, and constructing a major radio telescope facility — and maybe, if there's money left over, an infrared facility — and sampling the universe for signals? We know what to look for. That would be the rat-a-tat-tat of a radio signal. We don't know exactly what the code would be, but we'd be looking for pulses in the radio, in the infrared maybe, in the X-ray or UV. We'd have to think broadly. But this is a great quest for humanity. It's the Armstrong, it's the Columbus of our time, essentially reaching out with radio waves and hunting for alien intelligent life. It would be a marvelous, inspirational effort. And right now we don't have enough going on, in my opinion. Because it would mean — all 7 billion people on planet Earth would get up in the morning wondering, "Did they find the signal last night?" SPACE.com: It makes you wonder why nations haven't joined together to do something like this. Economically, it would be a drop in the bucket. Marcy: It's a drop in the bucket. Frankly, $1 billion would be good. It sounds like $1 billion is a lot of money. But not really. NASA's budget is $19 billion. Nineteen billion dollars every single year. So how about a billion of that for a SETI search? How about one year — 5 percent — to do SETI in a historic, Apollo-like way? I mean, Wow! It puts Armstrong and the invention of fire sort of on a par. So it's worth one-nineteenth of one year's NASA budget. I think it's a great idea, and we know how to do it. Yeah, it's a luxury. We need to feed the people on the planet Earth, we need to provide health care, we need to provide better education, we need to make sure that human beings are living. But we're doing that. And a billion is really a teeny fraction of many countries' annual budget.